One of the strengths of Divi is its compatibility with WooCommerce and other eCommerce platforms. Divi is well suited to create any type of product or service eCommerce website you can image. Fortunately, you don’t have to start from scratch. Another advantage of Divi is the amazing number of professionally designed child themes available in the marketplaces from third-party developers. In this article, we take a look at the 10 best Divi eCommerce child themes to help you build your eCommerce website. The child themes are in no particular order. RoyalCommerce was made for any type of store. It uses a minimal design to put the focus on your products. It has four style options and lots of pages. The design and features are based on the top eCommerce websites to improve the shopper’s experience. Features include quick view, slider, wishlist, image zoom, Ajax filtering, sticky shopping cart, header icons, fixed header on mobile, banners, and more. It also includes the Divi Logo Swap plugin. Each of these can be turned on or off. 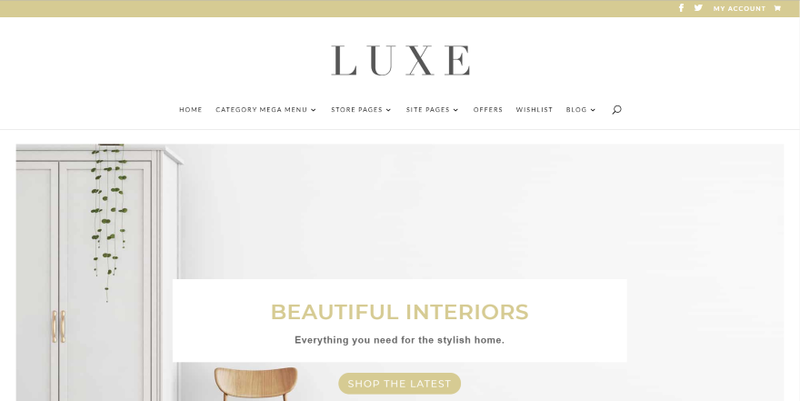 Luxe is an online store child theme for any type of store. It comes with 20 layouts including lots of store and site pages. It includes several marketing pages, and also comes with email sign up and thank you pages. It includes the premium plugins Divi Woo Layout Injector and The Grid so you can style your store to match your branding. It also includes the free YITH Wishlist plugin and a Mega Menu. Fleur was designed with crafters, female entrepreneurs, and bloggers in mind. 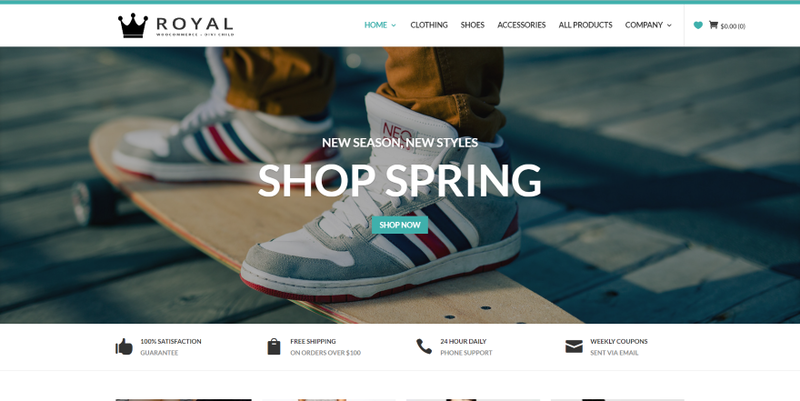 It’s now on version 2.0, which has had lots of updates with the goal of being the easiest WooCommerce child theme to use. It has specialized styling for the home, blog, blog archive, search, shop, product, checkout, and account pages. It comes with several premium plugins: CPT, Divi Layout Injector, Woo Layout Injector, Search, and Taxonomy. It also includes Woo Product Carousel. Colors are set in the stylesheet. Shop was developed to build any type of web store. It comes with lots of pages to build your store. Pages include 6 home pages, about, 9 shop pages (including on sale, featured products, recent, top rated, etc. ), a product page, account, cart, checkout, 7 blog pages, FAQ, and a contact page. All of the designs are simple and elegant. Divi eCommerce was designed to showcase both products and services for any type of business. It has lots of elements to drive sales. It includes two home pages with elements to display Featured and Trending Product, a Deal of the Day countdown for time-sensitive sales or offers, and a styled email optin form. It also includes a shop page with a custom WooCommerce sidebar, 3 product pages, breadcrumbs, vertical tabbed displays, blog, about, contact, and WooCommerce pages. D-Market was designed with fashion shops in mind and it’s suitable for any type of clothing or accessories store for men or women. It uses a flat design and is optimized for speed. It comes with over 12 pages, integration for the YITH Wishlist plugin, and a newsletter popup form using the Bloom plugin. 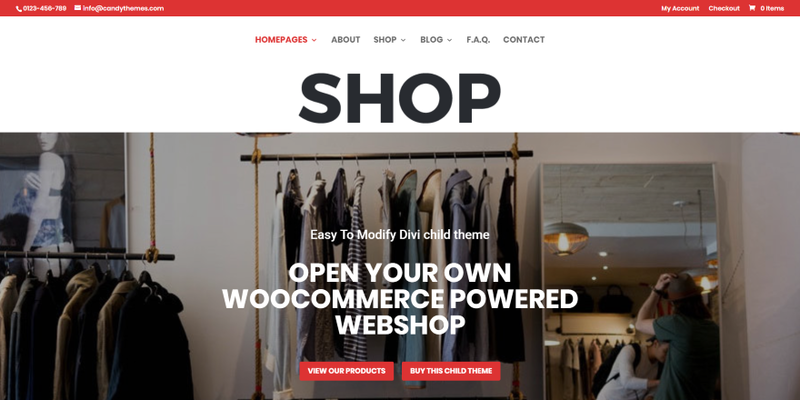 This Divi child theme requires Contact Form 7, YITH WooCommerce Wishlist, WP-PageNavi, and of course WooCommerce. Most of the images in the demo are also included. Divi Shopper was made for any type of eCommerce website to sell products or services. It has a minimal layout design with 13 sections and 4 landing page options. 12 of the section are unique and were designed specifically to fit perfectly on smartphone and tablet screens. It includes a few premium plugins: Slider Revolution and QuadMenu. Features include animated sections, breadcrumbs, a secondary product thumbnail flipper, quick view, a social sharing option, a dropdown shopping cart, and more. Store was designed to build any type of online shop to sell any type of product. It comes with lots of pages to build your store with such as a home page, store page, single product page, shopping cart, account, checkout, blog and blog single post, FAQ, and a contact page. This child theme has lots of styled modules that make elegant use of imagery and parallax. WooU is a multi-purpose eCommerce child theme that’s designed for any type of business. It has a unique layout with elements that are offset from each other. It comes with 20 pages for WooCommerce, services, pricing, FAQ, support, tools, etc., as well as styled elements such as testimonials, sliders, modals, contact and registration forms, section styling, and more. It includes lots of plugins: Gdo-Modal, Gdo-Posts, Gdo-products, Gdo-projects, Flex-projects, Flex-Gallery, and Gdo-Slider. It also has animations and it has the famous Ken Burns effect to make your images stand out. It comes with several files: social media icons, SVG image files, PNG logo, and favicon files. Woo is a simple design made for events and startups, but it would work well for any type of eCommerce website with a focus on simplicity. It has a single homepage and the expected WooCommerce pages. Pages include home, shop, categories, cart, and checkout. It also includes styled contact forms. Even with its focus on simplicity it still makes great use of background images and color overlays to create elegant calls to action for your shop pages. It also includes an elegant image gallery and a styled newsletter form. 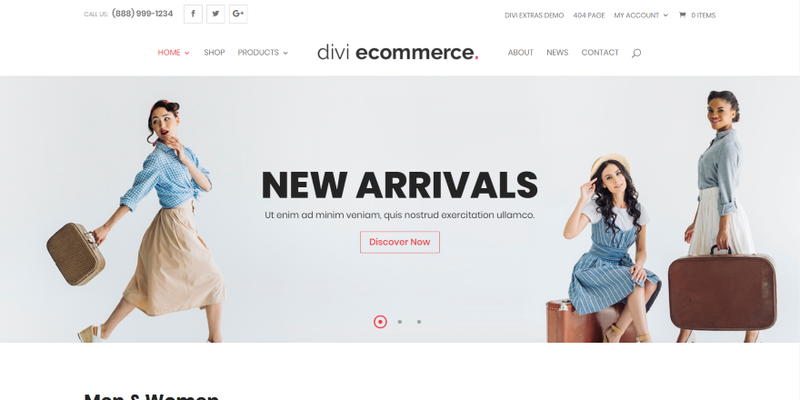 That’s our look at the 10 best Divi eCommerce child themes to help you get a head start on building your online store with Divi. Each of the child themes includes lots of pages, features, and styling options. Several even include premium plugins: some that were made specifically for Divi and others that are not usually available in a Divi child theme. Between them, you’re sure to find the perfect child theme for your next Divi eCommerce project. We want to hear from you. 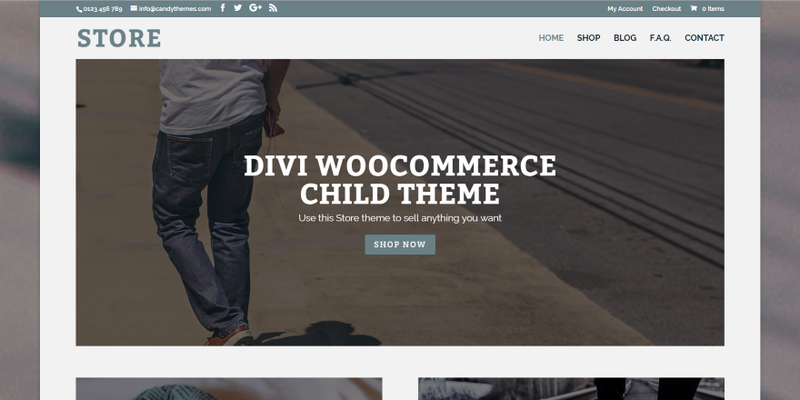 Have you tried any of these Divi eCommerce child themes? Let us know what you think about them in the comments. Thank you for the divi ecommerce. These look great. Divi is a very good template for SEO. Intuitive, extensive and light. 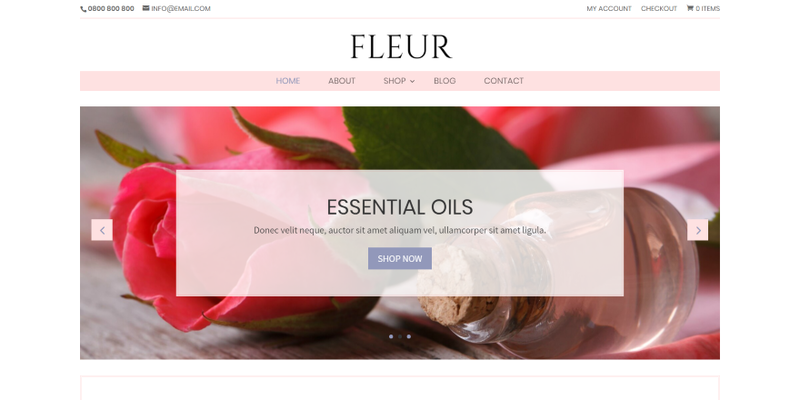 Why not et creates an e-com theme for woocommerce? Randy, you really confused me with handful of e-commerce themes to choose from. Unbelievable design ever. Thanks so much for including RoyalCommerce. Thanks a lot for the updated list guys. My recommendation is on RoyalCommerce – great theme and easy to use. Haven’t tried many of the other though. Will them a try when I get t he chance! 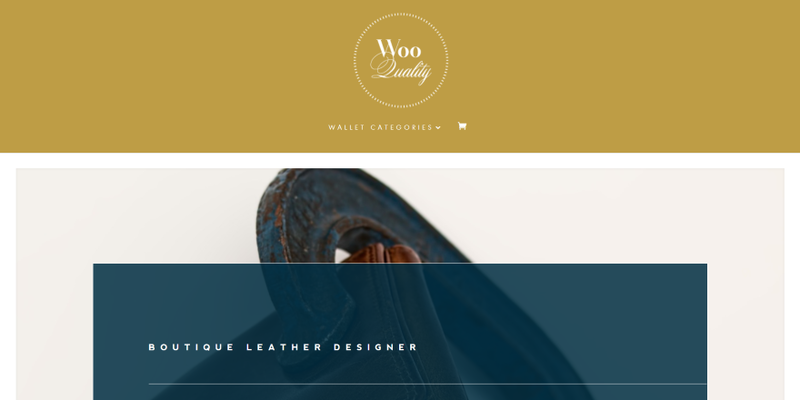 We want to thank you very much for adding our child themes Woou & Woo to this eCommerce list. Thank you for your work !!! Thank you for this useful post! Will definitely consider themes child themes for my eCommerce websites! Thank you for this interesting article. Especially for the Divi Commerce tip. I´v got my own online shop for safety cutters in Germany with DIVI and woocommerce. I´ve tried several times to include the DIVI page builder in woocommerce, but always failed. So I´ll give that plugin definitely a try. Can we use these themes with Easy Digital Downloads? I HATE Woo Commerce. Or should I just make my own design and pages and forget using any of these? Thanks! When I need to update Divi, I do that by hitting the “update” button in the WordPress dashboard under Updates, themes. Is that the way that child themes are updated, or do the files have to be uploaded the way they are the first time? Sorry if that question is confusing, but I have one plugin that I intend to quick using because doesn’t update though the WordPress update system. I assume that you upload the theme when you purchase it, but what about updates? How does one go about getting updates for child themes such as these? I am mostly concerned about security issues when I speak of updates. Will it update through WordPress like Divi does when we put our purchase code in? Why isn’t the WooCommerce product page support included for Divi Builder out of the box? Why do we need to buy a third party extension to get this functionality? Are you planning on adding WooCommerce product page support in Divi 3.0 or future versions? These are great. A client needs a catalog site but w/o the actual shopping experience. How do I do that? Great list. Thank you to all the child theme developers. Can wait more two ………………. days !!! Thanks for the shoutout Shane 🙂 Low price doesn’t mean low quality though. I to add as much value and support as possible while asking a fair price for my work. Ok, but most* of your themes are a copy of what ET have already put out for free! I have not really seen a free child theme, but the freebie from yesterday comes close. The header at the top says “free divi resources.” Is this the first time during the divi countdown where the free resource you’re giving away is just a list of stuff you can buy? I thought i was the only one that see this… the banner at the top still says “free divi resources.” but this is a list of paid for child themes. This is NOT free divi resources. a small bit of false advertising? Hi Kev, in this instance it is the post itself which is the free resource. I understand your confusion though. We’ve had to make this clear on other posts too. Thanks for including Shop child theme on this nice list. Divi Commerce does not look bad as a plugin, but seems like it has to be at version 3.0 based on what they want to do to really be what we need. Thank you very much Randy for including Nellie. However, some features like AC ShortCodes plugin will be included in Nellie 1.4 which should be released around 20th Sept this year. Thanks once again. You’re welcome Deep! Thanks for the update. 150$ for a theme ??? If you have some CSS coding skills, will be able to replicate this joke in few hours. Otherwise, with little creativity you can make your own theme, without any complications. Divi template offer infinite possibilities, and, if you pay for this, means you have some basic knowledge. The problem with this is that if you’ve worked with WooCommerce you’ll know that it is a B*TCH to work with. RoyalCommerce looks amazing and I don’t doubt it’s worth the money, even though it’s expensive. This is so cool! I cannot wait for Divi 3.0!!! Do these themes also work with plugin GermanMarket? And thanks from me for including Artisan and Solo! 3 days to go. That’s gone faster than I thought! Thanks for mentioning Rise & Shine, Randy, we appreciate it. A perfect example of how to package and implement a Child Theme. At $49 it’s a no-brainer as, in my opinion, it is under priced.